As a photographer, one of the things I really had been looking forward to doing in Africa was a little bit of star photography. In South America, North America and Europe the sky had often been far too cloudy or covered in light pollution. I really only got the chance to give this type of photography once as I took a star photo over Havasu Falls. However, North Africa in particular has been very kind to me in terms of shooting the stars. The sky is crisp and clean, there is hardly any light pollution and the dry desert means that there are rarely any clouds. I shot this photo from the terrace I had been sleeping on in Chefchaouen, Morocco. 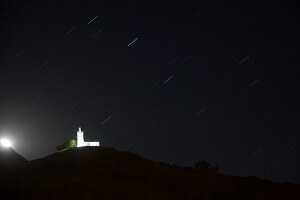 This photo of the lighthouse over Chefchaouen didn’t turn out anything like I had hoped. I was shooting a series of images and then was planning on stacking them together to give the star trails effect. However, what I hadn’t counted on was that the moon was set to pop up from behind the mountain. As I saw the light of the moon beginning to show I got really frustrated thinking that my work would all be for not. However, I stuck with it and stopped shooting the images as soon as the moon showed about a third of itself. In the end, the effect of the moon rising and the stars falling came out really cool and I’m glad I stuck with the image. If you’re interested in this type of photography, there are lots of tutorials out there on YouTube. When I shoot these images there are two methods I use, the super long exposures using bulb mode on my camera, and stacking images like I did for the image from Chefchaouen. If you’re going to use the stacking method try a program called ImageStacker, it costs a couple bucks but it’s worth it if you’re planning o doing some serious star photography. Looks very surreal. Awesome shot. Thanks Nancie, I’m glad you like the shot!